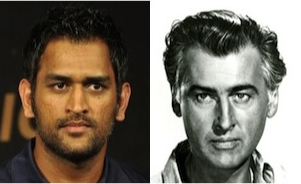 M. S. Dhoni (left) and Stewart Granger. You lookin’ at me? The Indian cricket captain Mahendra Singh (M. S.) Dhoni is a phlegmatic individual. But then you’d have to be, given that you bear the weight of 1.2 billion passionate fans’ expectations on your shoulders. Unlike many cricket captains today, Dhoni plays all three forms of the game (Twenty20, One Day Internationals, and Test matches). As the wicketkeeper, he’s engaged to the maximal level on the field; as the team’s number seven or eight batsmen, his job is to save his side from the errors and failures of the batsmen higher in the order and/or to shepherd the batsmen coming in in such a way that a competitive or winning total is posted. It’s a tough ask for anyone, and in recent years Dhoni has found himself having to rescue a feckless side more than once. Dhoni is not without his critics. These carpers contend that he’s clearly more comfortable playing limited-overs cricket than Test matches and worry that he’s so inscrutable and taciturn that he sometimes lets the game drift when India needs to seize the initiative and drive the contest. These may be fair observations, but M.S. has just made a few of the cavillers eat their words by posting the highest ever run total by an Indian captain, and wicketkeeper (224 runs), and in a Test match no less. And against a formidable opposition, the Australians. He did it with his customary combination of caution and explosive power, and without apparently breaking a sweat or smiling once. Only at the end of a day in which he’d scored 217 runs did he finally acknowledge the crowd’s adulation with a shake of the bat and the taking off of his helmet as he strode off the field. Dhoni is no longer the pretty boy heartthrob from the other side of the tracks. He now has the looks, the institutional and physical solidity of someone come of age, and the derring do and maturity of the characters that Stewart Granger used to play: the adult in the expeditionary party who makes the tough decisions and takes on the big game with a minimum of fuss and maximal destructive power, but only when necessary. With any luck, this innings will make Dhoni embrace the long form of the game with the brilliance and skill he’s employed in the shorter forms. If so, then watch out world! This entry was posted in Cricket, India and tagged M. S. Dhoni, Stewart Granger. Bookmark the permalink.